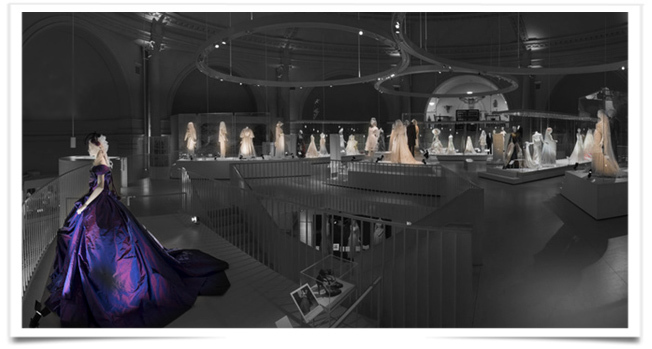 The exhibition “Wedding Dresses 1775 – 2014” at the Victoria & Albert Museum pays homage to this symbolic garment as it charts its deeply seeded history from the strict dress codes of medieval times to the glitzy celebrity affairs of today. The first exhibit featuring a pastoral gown from the 1700s complete with abergère, or a shepherdess-style hat, sets the tone of the exhibition. Unsurprisingly, the exhibition presents the evolution of the wedding dress in the British society with a few token exceptions. A quick view through revealed eighteenth century wedding dresses to have very specific codes that reflected the prevalent social class. The pronounced discrepancies of the gowns spelled out the stark class system in England back then, where fashioning a gown that was ostentatious by one’s social standing would have been seriously frowned upon. Even the short-lived austerity of post-war Britain couldn’t stop the interest in glamorous wedding gowns in the advent of fashion designers from Paris like Charles Federick Worth and Christian Dior. The trend was further fueled by the gaze on Royal Weddings from Queen Elizabeth II right up to Kate Middleton in her custom-made Alexander McQueen by Sarah Burton. This entry was posted in BREAKING MODE, BREAKING NEWS and tagged fashionoutsider.net, LONDON, modeaparis, MODEPARIS by admin. Bookmark the permalink.